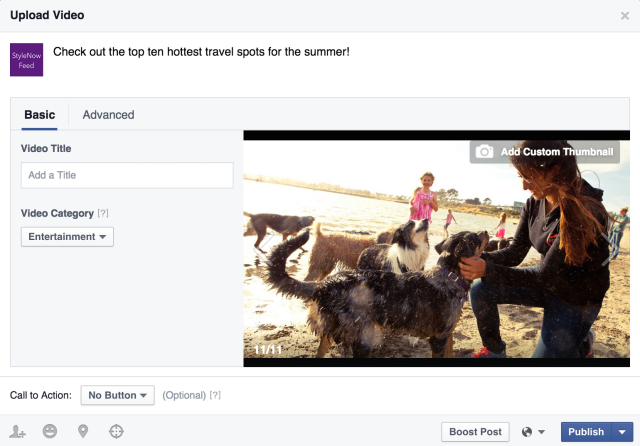 Facebook has been strengthening its video chops recently as it becomes an increasingly notable competitor to YouTube, and today it’s providing new tools for Page admins to customize how they distribute video content on the platform. First up, admins can now post ‘secret’ videos. It’s similar to YouTube’s ‘unlisted’ function, such that you can only access the video with a direct URL. This allows you to share a video privately, or to embed it on another site without it showing up on your Page’s feed or anywhere else on the social network. Admins can now restrict audiences by age and gender (location and language were already available). Videos can be labeled based on interest categories like Entertainment or News. You can now publish content straight to the Videos tab without it showing up anywhere else, not even your own timeline. Note that this is different from the unlisted videos mentioned earlier – those don’t show up anywhere accessible to the public. Videos can be labelled based on categories like Entertainment or News. You can choose you can add custom thumbnails. Third-party embeds can be blocked. While these featured are covered by the new Facebook Video API – unveiled a few months ago at F8 – today’s update makes it easy for admins to manage these features straight from their own Pages. Facebook’s also introducing a Video Library where Page owners can organize and update their videos all in one place. You could look up an old video, for instance, or select multiple ones to modify in bulk. Some of the changes you can make include editing a video’s metadata, adding subtitles or changing the thumbnail. You can also prohibit third party embeds and publishing to News Feed. It’s also the only place secret videos will show up. The series of changes should help provide businesses with management tools more akin to what they’re familiar with on YouTube. Facebook says the updates will arrive to Page admins everywhere in the coming weeks.